We strive to serve all our customers - local, part-time and visitors - with excellent customer service. We realize that buying a boat or shoreline equipment is a major purchase and we'll work with you to make your purchase as worry-free as possible. Our Sales Department is well-trained and ready to help you with questions about our products. We realize that buying a boat or shoreline equipment is a major purchase. We will work with you to make your purchase as worry-free as possible. We are authorized dealers for MirroCraft Boats, TMC Pontoons, Montego Bay Pontoons, Evinrude and Mercury motors, Trophy Pontoon and Utility Trailers and DCT Utility Trailers. We have an extensive network of knowledgeable professionals to assist you with your purchases. Our Service Department has experienced mechanics with over 75 years of combined service experience. Our certified technicians are fully-trained and qualified to do repairs - from simple "fix-its" to major overhauls. 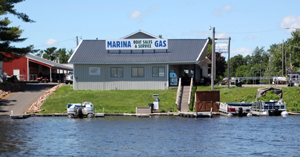 We’re the only full service marina on the Chetek Chain of Lakes. We have a team available to install shoreline equipment, docks and lifts. Our Parts Department is fully-stocked to fulfill your needs and, if we don’t have the part you need, just ask. We’ll place a special order for you, typically with next-day service. We also have crews to install your docks and lifts.